It’s a name given to a flattened chicken whereby a whole chicken is cut in the middle into a butterfly shape. Nothing complicated here this can be done by using a pair of kitchen scissors, cut in the middle and casually flatten the chicken. The technique of Spatchcocking is great as it exposes the chicken surface area including the skin which is a real bonus of having more crispy chicken skins to enjoy. 2. Butterfly chicken by placing breast side down and using heavy-duty kitchen scissors or shears to cut along both sides of backbone, turn chicken over and open it, press gently to flatten it. Using a sharp knife slash into the chicken thigh (this is optional). This will help the chicken to cook quicker, and enable the flavours/seasoning to penetrate right into meat. 3. A little tip, using your finger gently run under the chicken skin in such a way to separate the skin from the chicken. 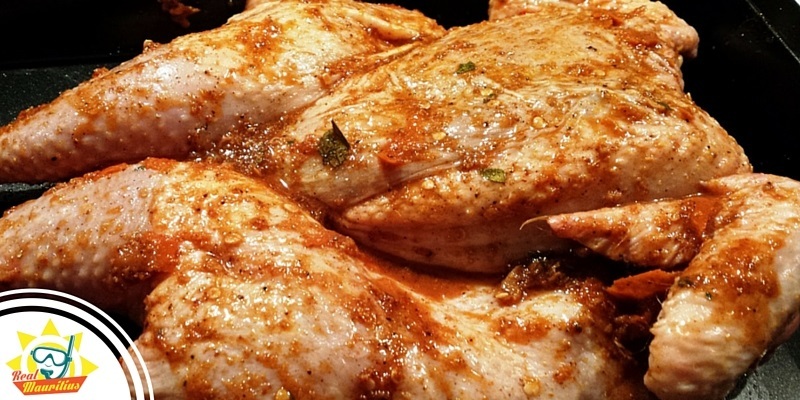 In doing this I like to rub the spice mix in this cavity rather than rubbing the spices all over the skin surface – this gives the chicken a more flavorsome taste without burning the spices leaving you with crispy spicy chicken skin. 4. Rub the prepared marinade spice inside and under the skin cavity and paint rest of the marinade on surface, placing the lemon slices around. 6. If cooking in the oven, preheat it to 200°C. Place the chicken skin side up in a roasting dish and roast for 45 minutes at 200°C. Baste the chicken through, scatter the shallots around in the baking tray reduce oven temperature to 180°C and cook for another 30minutes until the chicken skin is crisp and the meat almost falling off the bone. 7. Transfer chicken to a carving board, and leave to rest 10 minutes. Cut chicken into portions, and serve with roasted vegetable. I served mine with tender stem green baby broccoli and roast vegetables.